At this point in the season, all 32 teams in the NFL have, at the very least, played half of their scheduled games. Just last week we gave you our midseason predictions on which players will win each of the league’s major individual awards, and today we give you our midseason All-Pro team. To select our All-Pro team, we used a combination of individual statistics, team statistics, and player grades from Pro Football Focus (PFF). Without further ado, here is a look at what we decided. 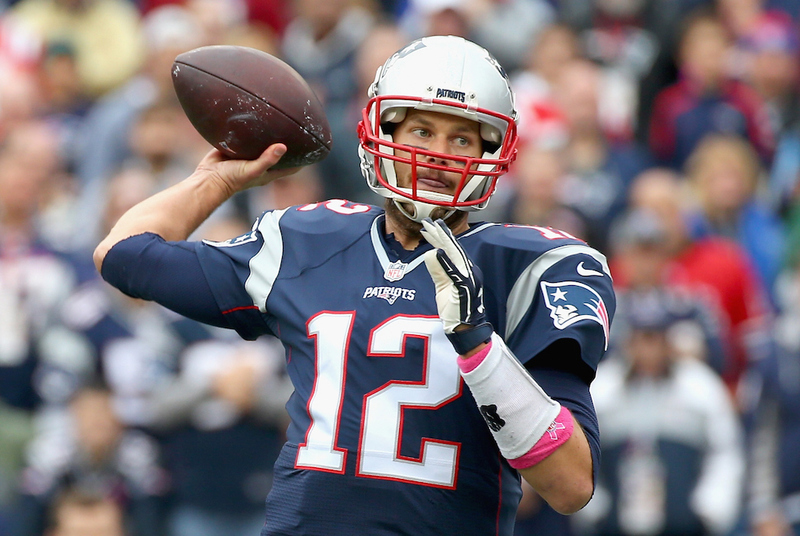 Brady (pictured above) is in the midst of one of the greatest seasons by a quarterback in NFL history. At this point, he is on track to be a unanimous selection for the 2015 NFL MVP award. Gurley leads the league in rushing yards per game (115.0) and yards per carry (6.1). The rookie out of Georgia is well on his way to winning the offensive Rookie of the Year Award as well. Freeman has been one of the biggest surprises of the 2015 season. Up to this point, he leads the league in rushing yards (709) and rushing touchdowns (9). We wouldn’t be surprised to see Freeman win the NFL Offensive Player of the Year Award. Jones leads the NFL in receiving yards (892) and receptions (70), and is well on his way to posting one of the better seasons by a wide receiver in recent history. Hopkins is right on Jones’ heels with 870 receiving yards on 66 receptions and is rapidly establishing himself as one of the game’s most dynamic offensive playmakers. Brown remains one of the league’s premier wideouts and is well on his way to another 100-catch, 1,500-yard receiving season in 2015. Gronkowski is far and away the best tight end in the NFL, and we believe that the 6-foot-6-inch, 265-pounder has a legitimate case for the 2015 NFL Offensive Player of the Year Award. Thomas has an overall grade of 19.3 and ranks as the second-best offensive tackle in the league according to PFF. Smith has an overall grade of 25.6 and ranks as the best offensive tackle in the league. Martin has an overall grade of 21.8 and ranks as the third-best offensive guard in the league. Incognito has an overall grade of 22.3 and ranks as the second-best offensive guard in the league. Khalil has an overall grade of 15.2 and ranks as the best center in the league according to PFF. 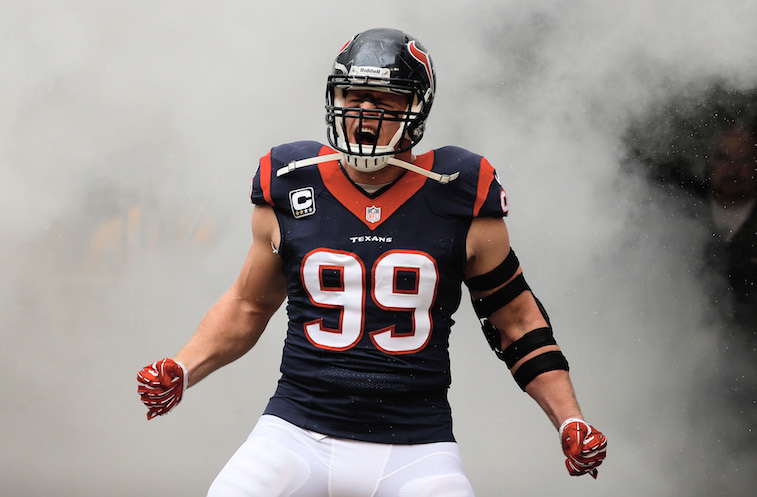 Watt isn’t garnering MVP attention like he was a year ago, but the three-time All-Pro leads the league in sacks and has an excellent chance of winning his third career Defensive Player of the Year Award. Jordan has been one of the few bright spots on a Saints defense that has struggled for most of the season. He ranks as the best 4-3 defensive end in the league according to PFF and will likely finish the season with a double-digit sack total. Donald has emerged as the best all-around defensive tackle in the league. Atkins has officially reestablished his place among the NFL’s best interior defensive linemen. Without his dominant play, the Bengals likely wouldn’t be undefeated at this point in the season. Miller is the best player on the best defense in the league. Mack has developed into one of the best defensive players in the league in just his second professional season. If he can stay healthy, the sky is the limit for the 24-year-old linebacker. Kuechly remains a perennial Defensive Player of the Year candidate. Needless to say, the Panthers wouldn’t be 8-0 without him in the lineup. Marshall is in the midst of a breakout season. In his second season as a full-time starter, the 26-year-old out of Nevada has an overall grade of 8.3 and ranks as the second-best inside linebacker in the league according to PFF. Harris continues to quietly dominate opposing wide receivers. The former undrafted free agent out of Kansas is one of the rare NFL cornerbacks that can be equally effective against smaller slot receivers as he is against larger outside receivers. Norman is quickly emerging as one of the best cornerbacks in the game and is tied for the league lead with two interceptions returned for touchdowns. Mathieu has been unquestionably the best safety in the league in 2015. Smith continues to play at an extremely high level and is one of the main reasons the Vikings are in a great position to land a spot in the 2015 NFC Playoffs. 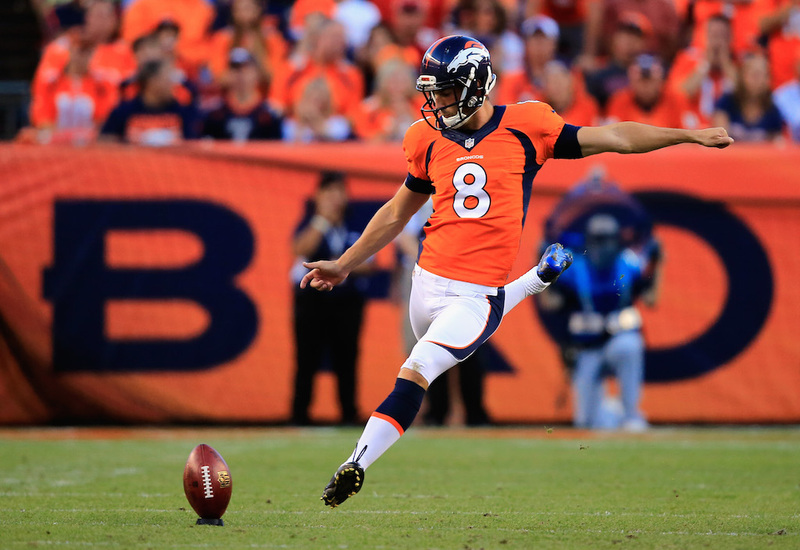 Simply put, there isn’t a more talented kicker in the league than McManus right now. He’s clutch, with one of the strongest legs in the league, and has dramatically improved his accuracy. Don’t let the notion that he plays in the thin air of Denver, Colorado fool you — this guy is for real. McAfee is one of the most physically gifted NFL punters in recent memory. He can do it all; pin teams inside the 20-yard line, punt for distance, hang time, and direction, and to top it all off, he is one of the best kickoff specialists in the league. Harris leads the league, averaging 34.1 yards per kickoff return with one touchdown. Sproles also leads the league, averaging 14.7 yards per punt return with one touchdown.